The head of the World Forum for Proximity of Islamic Schools of Thought has welcomed a proposal by the grand imam of Al-Azhar to form a joint Sunni-Shiite committee to address the threat of Takfiri terrorism. The secretary general of the World Forum for Proximity of Islamic Schools of Thought (WFPIST) has called for efforts to tap into the potential of Sunni and Shiite scholars, saying that unity in the Islamic world is direly needed to address the threats posed by Takfiri groups. 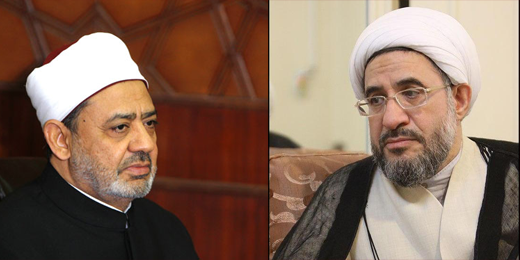 Ayatollah Mohsen Araki made the plea in a letter to Grand Imam of Al-Azhar Ahmed el-Tayeb following the latter’s speech on the need for top Sunni and Shiite scholars to have more interaction and discuss proximity [among Islamic denominations] and the threats posed by Takfiri groups. I have heard many of your speeches on different occasions, the last one of which focused on your blessed call for the holding of a joint session between Sunni and Shiite scientists to discuss the issues of the world of Islam; make coordination and take joint steps to face the threat posed by Takfiri terrorists; and prevent measures which may divide the Sunnis and Shiites in the world of Islam. The World Forum for Proximity of Islamic Schools of Thought (WFPIST) appreciates your worthwhile, fatherly stance which has injected new life to the hopes of all those who seek to make reforms and bring religious sects and denominations closer together. By taking such a stance, Al-Azhar University – which plays a basic, pivotal role in the Islamic Ummah – can [help] create unity among Muslims, and solve momentous issues of the Islamic world, especially the problems arising from sectarian violence and Takfiri terrorism. The WFPIST voices its readiness to take the necessary measures [in this regard] to lend support to your reformist and proximity-focused efforts, especially the implementation of the proposals put forward by a joint Sunni-Shiite committee. The WFPIST will send a delegation of the greatest Sunni and Shiite scholars to meet with you, launch cooperation to implement such proposals and take effective steps to help materialize unity in the Muslim world.